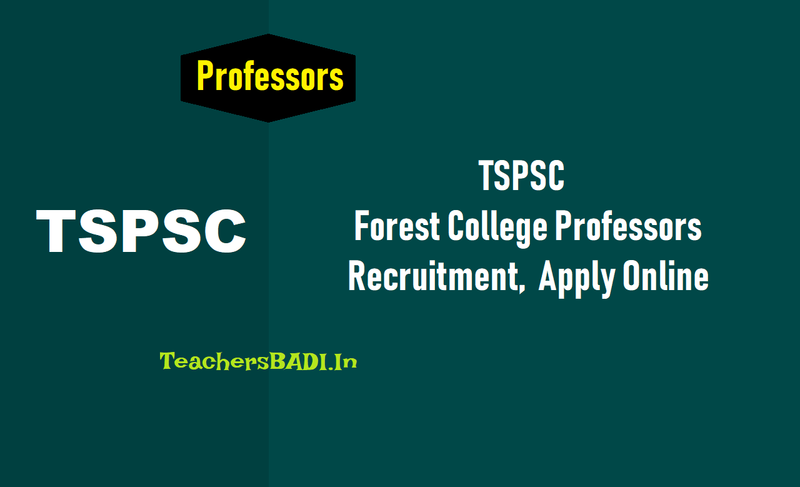 TSPSC Forest College Professors Recruitment 2018, Apply Online: TSPSC Professors, Associate Professors, Assistant Professors, Recruitment 2018, TSPSC Forest College Professors, Associate Professors, Assistant Professors, Librarians Recruitment 2018, Forest College Teaching Posts recruitment, Forest College Professors Recruitment, TSPSC Forest College Professors, Librarians Recruitment online application form, Eligibility criteria, How to apply, Exam date, Hall tickets, Answer key, Results and other details given here. TSPSC Teaching posts in Forest College and Research Institute (FCRI), Mulugu, Medak. TSPSC has published the Professors, Associate Professors, Assistant Professors, Librarians Recruitment 2018 notification on 10-09-2018 and applications are invited from qualified candidates through the proforma Application to be made available on Commission’s WEBSITE (www.tspsc.gov.in) to the post of Professors, Associate Professors, Assistant Professors in Forest College and Research Institute, Mulugu. The candidates, who applied for the post of Professors, Associate Professors and Assistant Professors through online that the last date for submission of manual applications (Bound booklet format in triplicate (03 copies)) in TSPSC Office, Prathiba Bhavan is 20/10/2018. Candidates may submit booklets in person or through registered post. Post Code No. Name of the Post No. of Vacancies Age as on 01/07/2018 Min. Max. Scale of Pay Rs. Educational Qualification: Masters Degree, Ph.D, NET/ SLET/ SET with teaching/ research experience. Age limit: Age as on 01.07.2018: 21 to 58 years. (Remittance of Fee) Each applicant must pay Rs. 200/- (RUPEES TWO HUNDRED ONLY) towards Online Application Processing Fee. ii. Last date for submission of ONLINE applications Dt. 01/10/2018.